While scrolling through the overwhelming tapestry of mostly unrecognizable cover art on Amazon Video last night, my eyes came to a stop at a row containing nothing but images of Robert Stack. “Wait a second,” I thought. 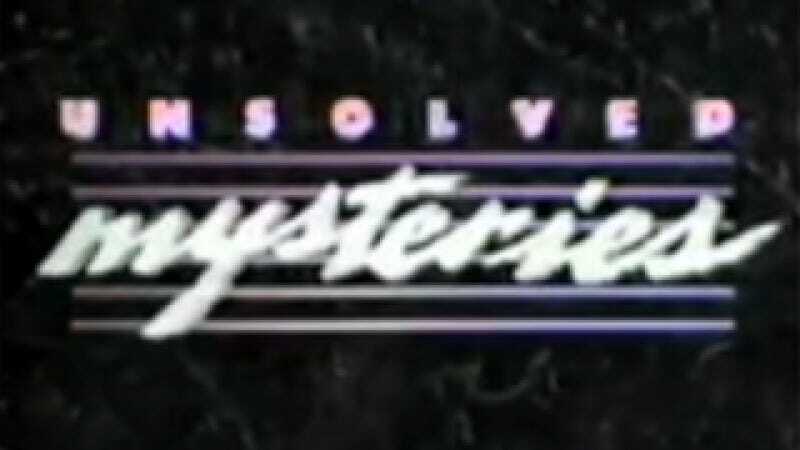 “Could this really be happening?” After taking a few moments to confirm, I learned that a dream I didn’t know I had until last night had suddenly come true: Unsolved Mysteries is now streaming on Amazon Prime. For the uninitiated—you know, those who lived through the 90s without Robert Stack-induced nightmares—the series, which aired off and on from 1987 to 2008, was a showcase for stories about unsolved crimes (typically murders) and other disturbing events (typically aliens) as told by those who experienced them. For each mystery, the show provided interviews with eyewitnesses, reenactments (sometimes starring eventual Oscar winners), and—if they were lucky—actual recordings of the event, whatever it was. The goal, of course, was to solve the mysteries, and each episode ended with a plea for information. Sometimes this worked. Usually it didn’t. Though the low-budget re-enactments were often so poorly cast and acted that it was hard not to chuckle during their most dramatic moments, Unsolved Mysteries treated every story and eyewitness—however unbelievable or over-the-top—with the same earnest intensity. And it was that perfect storm of gravitas (thanks primarily to Stack, the show’s long-time host), camp, and spooky music that made the show a thrilling, if regrettable, viewing experience. Last night, after watching an episode from season one about a UFO that crash-landed in a small Texas town and the relatively famous (and spectacularly unnerving) season 3 premiere about an arsonist who filmed his crimes on video, I remembered the days when I’d watch the show alone in the dark, only to be interrupted by my concerned mother asking if I really wanted to be consuming entertainment that was sure to give me nightmares. “I’ll be fine, mom,” I’d tell her. I was lying then, and if I told you I was fine last night, I’d be lying now. The show is now streaming on Amazon Prime, and it looks better than ever.